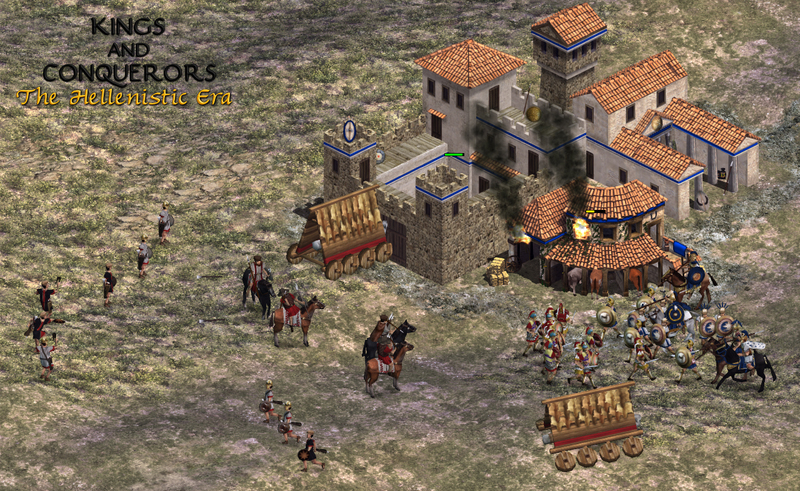 Kings and Conquerors: The Hellenistic Era is a total conversion modification for Rise of Nations: Thrones and Patriots. Our aim is to bring the Hellenistic period to life. A set of highly unique factions. New unit types, such as priests, levies, mercenaries and elite units. Many new wonders and buildings. Nations will receive Unique Buildings in addition to Unique Units that provide a range of bonuses. A new political system with three tiers of policy decisions, providing strong bonuses and unlocking new units and buildings. Army reforms can be enacted to upgrade and unlock units. Combat mechanics overhauled. Ranged units may now miss their target, flanking damage has been drastically increased and units can no longer turn around instantly to counter an attack from behind. Increased population limit and map sizes; a number of maps have been altered to fit with the mod's Hellenistic period setting. We can use the help of any experienced modders who are willing to make a contribution. We need modellers, animators and scripters especially. Please send a PM here if you are interested. The Hellenistic Era 0.11 Released! The Hellenistic 0.11 has now been released! This version features several small additions and fixes to make the Roman and Macedonian factions more complete. The Hellenistic Era 0.11 is now available on the Steam Workshop! You can subscribe to the mod here. IMPORTANT: This mod will crash if it's priority is set below certain mods, notably the Terrain 5 Extended mod. To fix this, go to Tools and Extras => Steam Workshop, select the Terrain 5 Extended mod from the list and move it to the bottom by pressing "priority down". Then, just to be safe, move The Hellenistic Era to the top of the list by pressing "priority up". 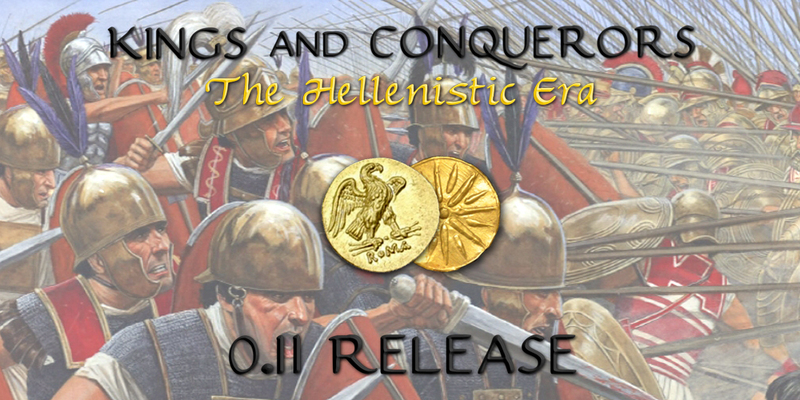 New units: Kestrosphendonetai and Hiera Ile for the Macedonians, Vigiles for the Romans. Thanks to The_Fulcrum, heavily-damaged forts can now be captured if you have more soldiers nearby than its owner. With the Informer ability you can also capture undamaged forts. The Peasant Dwellings, Noble Residence, Sporting Centre and Cultural Centre now produce resource trickles. Several bugs and balancing issues have been fixed. In order for the AI build orders to work, make sure that you list the human players before the AI players when setting up a quick battle, and make sure that you are using red as your player colour. Many of the scripted features have not been implemented, so you won't be able to spawn mobs from cities or convert enemy citizens into slaves for instance. Due to the custom script and the new models with higher polycounts, the mod will be more demanding on your computer. However if you have a decent computer then it shouldn't that noticeable. With the exception of the Trireme and Ballista, naval and siege warfare have not been touched on and probably won't be until after the first release yet due to heavy modelling and animation requirements. The Hellenistic Era 0.1 Released! 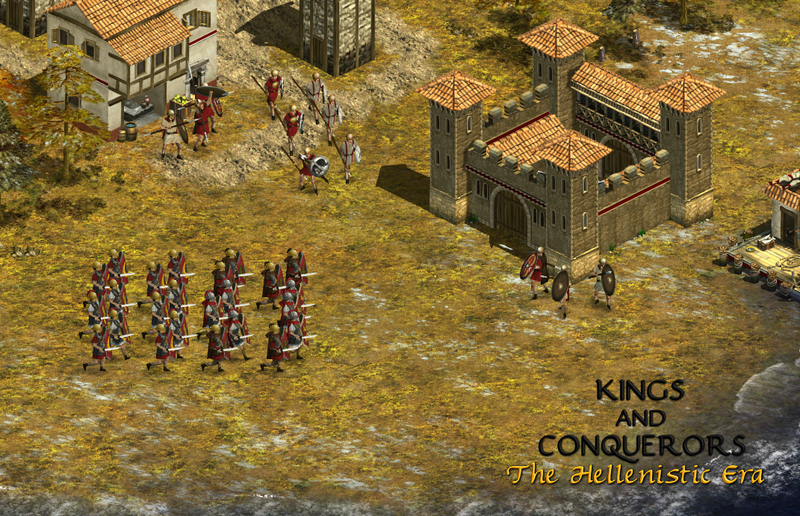 Kings and Conquerors: The Hellenistic Era will be compatible with the Extended Edition as well as the original Rise of Nations. The second part of a preview covering The Hellenistic Era's Macedonian faction. The first part of a preview covering The Hellenistic Era's Macedonian faction. This version is for those who have the Rise of Nations Extended Edition. This version is for those who have Rise of Nations: Thrones and Patriots (i.e. not the Extended Edition). With this announcement, I now declare that this mod is now 66% complete, with most factions now having received their required infantry units, and all cav archers are in place. There will be no further updates for a long, long time. I am working on another game project. Only if there is interest will I consider updating it, else you will have to wait for a long time before it can be completed. Folks, we have an announcement to make. This mod is not dead - at least not yet. Instead, it has been reworked and is being brought into a condition where someday, it will be finished. I now present to you its continuation project: The Wolf Among Lions! best mod ever trust me everyone im a doctor! Some of you will be wondering why there has been no update on this mod, so I will make this brief. Firstly, Super7700 is no longer with us. He has personally told me he has ceased development of this mod. It is actually NOT going to be available in the first version of this mod (there is a 2nd version being prepared, which will cover the transition of Rome to the empire). And it was more of an accident. But I can confirm, Suebi are as good as co0mpleted, while the Carthaginians, and Nabataeans are nearing comnpletion. If you have been monitoring our Wiki, you will notice that several new unit pages with pics have been created over the past year. This is NOT a coincidence. The unit pages contain screenshots of new units that I've managed to test to perfection. A vast slew of Carthaginian infantry has been added to the patch, so Carthage and the Nabataean Arabs should be partially playable in the next release. After several months (sorry for the long delay) I can confirm that a new patch is being created for Kings & Conquerors. This patch is also meant to be promo material for the next update for this mod which will be massive and diverge greatly from the original. Should be accessible, just download from Steam Workshop now.